An older pick from my local library, I decided it was time to give this one a read yesterday: again, it was a mixed read. Not because it was mediocre - it wasn't - but because Jude Fisher's Sorcery Rising possessed good and bad points in almost equal measure. There are moments of real flair, and there are those which could, in my opinion, have benefited from a little more pruning. Well, on to the plot! 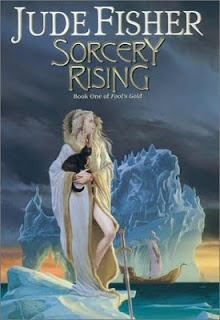 Sorcery Rising takes place in an initially magic-poor world, and it was, let me say, a genuine pleasure to see it carried off in such an interesting and believable manner. Politicking, customs - all were well-executed. However, this is changing. Sanctuary, hidden among icebergs and tundra, is about to release its fugitives: Virelai, the apprentice to Sanctuary's magical master, the Rose of Elda, an enigmatic, beautiful, and strangely-motivated woman, and a cat - Bete - in whom Sanctuary's master has enclosed his magic. An odd choice? Yes. Meanwhile, Katla Aransen and her family also travel to the Allfair - this time as merchants. Bearing pattern-forged blades and semi-precious sardonyx, they aim for profit: but will find something totally unexpected, because the magicless world is changing. Tycho Issian intends to sell his daughter to evade debt and win himself an alliance; the Vingos to purchase themselves a bride. King Ravn of Eyra likewise seeks a wedding: with both politics and passion to consider, his choice will be a difficult one. But as the world changes, no plan will leave unchanged, as these disparate plotlines are brought together in a fantastic conclusion at the Allfair. Sorcery Rising, without doubt, has moments of genuine flair. For example, Virelai and Bete make an interesting pair, and there are some genuinely great scenes to be found here. Although there are plenty of stock characters to be found (most notably among the female peruasions), Fisher's characters are genuinely sympathetic and likeable, and dialogue is never stilted, but constantly entertaining. However, there are individual moments that stand out as cliche, and these could have benefited from editing: Virelai with his later mantra, the Rosa Eldi and her actions. Still, overall, I must consider the plot a good one: it's interesting, has some genuine darker motifs, and is on the whole quite unpredictable. Overall, I'd recommend this to anyone in search of an entertaining, but not too strenuous read. It's not Erikson or Rothfuss, but it's a good read nonetheless. I'm always about non-strenuous reads. Great review, thanks for the introduction. Sounds like a nice relaxing read, in the down time preping for the next note taking book. I have not heard of this one till now. Thanks again for a great review. I actually just picked up this book at a second hand store because I remember really liking it when I first read it, many years ago. I never ended up finishing the series because I heard that the last book was a real disappointment so I never bothered getting it but I think I might give the series another shot. @ParaJunkee: Thanks! It's a nice, light fantasy to sit down with - not a novel you'll remember for weeks afterwards, but certainly an enjoyable read, I'd say. @Melissa: I hadn't either, and yes - it certainly is. @Simcha: I haven't heard much about the series, but I'll give the last book a go sometime as well. It's pretty enjoyable, but not brilliant, but I'm certainly reading on. :) I'd be interested to hear your thoughts if you do.